They ask: What do you do for a living these days? I answer: I’m a farmer. Yes, really! Me, the career professional. We’re milk farmers now. Really. No kidding. Yeah, huh? Isn’t life wild. But the real answer only works in Portuguese. If you raise cows you say, Mexo com leite. I mess around with milk. If you grow things, Mexo com roça. I mess around in the countryside. So what do I do? Mexo com agua. In truth I’m not a farmer, I’m a professional watering can. Our water runs in a constant stream from a neighboring spring. I wake in the morning and plug that stream into a sprinkler that waters the garden. As I do this I water the dogs‘ drinking bowl. I pour my coffee, watering myself. I fill a few pans of water, feed them to the water filter, and place the jug of water under it. This water will get transferred into a kitchen water dispenser for use in cooking, watering said coffeemaker, or into bottles of water in the fridge to fend off the roaring midday heat. Cradling my coffee-cup, I wander out into the yard and begin the tedium of watering the precious plants that aren’t reached by the sprinkler system: the bushes I just transplanted and am nursing through the hot summer, the infant grapevine that miraculously has survived one drought and three chicken munchings by its tendrils, the passionfruit bush that holds my dreams of endless juice, the extra tomato plants that might give an extra income at the local market (or in a pinch a heck of a lot of homemade pasta sauce), and the potted plants on the veranda. We are now in a streak of over twenty days without rain. If I do not water these green babies they will die horrible, brown-crackly deaths. It is a race against time. If I water the plants in full-day sun their pores will be open when the strong sun strikes their leaves and the sweet moisture will boil from their cells. The scalding will be worse than if I hadn’t watered them at all. 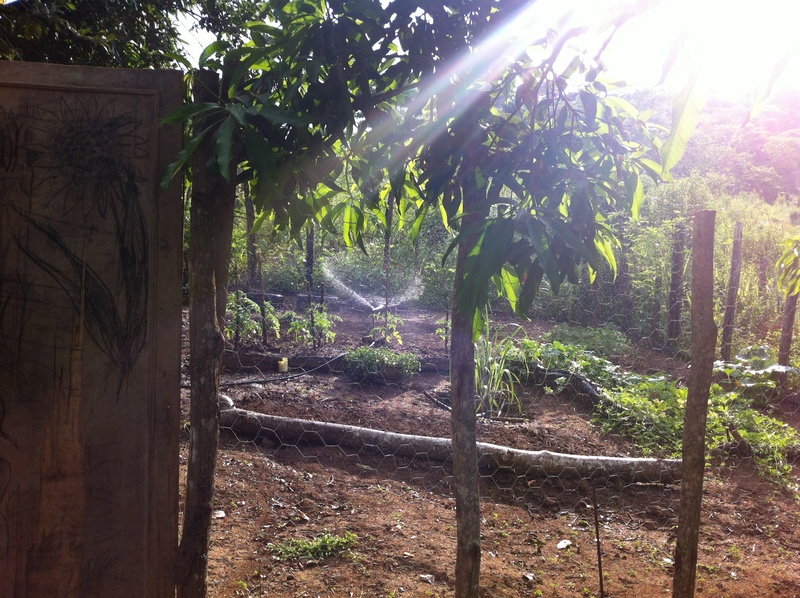 As the sun rises, before it extends its fingertips around the guava tree to reach the garden, I unplug the sprinkler system and plug in the cistern. This cistern waters our showers, the toilets, and the sinks. With four adults and six children the farm is quickly a hot, sweaty, stinky place when the cistern can’t be filled. It’s usually nearing empty every morning and the water rumbles as it strikes the floor of the tank. I busy myself with farm-like things listening with one ear to the changing sound of the cistern as it fills with water. Soon it’s nearly noon and I hear the patter of water falling. The cistern is full, spilling its extra contents down to the patio. The heat of the day is starting to boil anything in its path and the concrete patio scalds my feet, cool where the water has begun to puddle. The cows have begun to file thirstily towards the upper field in search of a long, cool drink of water. They arrive one by one down the worn cow path that crosses the field, and as soon as you see the first three emerge you can be sure that fifteen more will follow. A cow can drink 15 to 25 gallons of water a day, and nearly twice that if she’s milking. I fold the water line over itself, backing up the system so that it will spill back into a drinking cistern for the cows. If I do not do this, the cows will nudge and trod the water line until it separates (or breaks) to sip water from the PVC tubing that stretches across and under the field. Watering the cows is essential for them and convenient for me; I’d rather not walk the length of the water line in the hot afternoon sun to find where it needs to be mended. I rest in the heat of the day, finding tasks to do under the cool, vaulted ceilings of the farmhouse, watering myself a few more times with ice water from the fridge. The afternoon sun begins to fade and I venture out to do a few more farmish tasks. At the end of the afternoon my in-laws return from the upper part of the farm where they collect their drinking water. The children spill noisily into the veranda and their mother herds them into the shower, washing one, two, three at a time–as many as she can get her hands on. We water the cistern again to guarantee universal bath water. Night comes, and the orchard calls. I switch the water line to a hose that snakes through the orchard, fizzing drops of water through strategic holes in the line to water the fruit trees all night long. We water ourselves one last day, showering off the sweat of the day. For some reason your post reminded me of a classic exchange in the movie “Clueless” when one character informs another that a common friend has decided to study Pharmacy in college, to which the other replies that it is a bad choice since said friend could never live on a farm. Anyway following that same Clueless logic I am guessing that these days you are a cook specializing in Mexido. (mexo com isso, e aquilo). Haha, I’m an “expert” if re-mixing leftovers makes you an expert. 🙂 The beans are brown/red around here. Black beans are popular in Rio, it seems. In the interior we only use black beans in feijoada. I like that recipe link–neat that it teaches with images, not with words!